Two men have been jailed for 20 years for their part in a gang-related revenge shooting. Mason Phiri, 24, of Dines Close, Wilstead, and Alain Mbuku-Sengua, 21, of Marigold Way, Bedford, were found guilty of possessing a firearm with intent to cause fear of violence at a trial last year. And on Tuesday (April 3) they appeared at Northampton Crown Court where they were both sentenced to ten years. Due to the dangerousness they present both will serve a minimum of seven years before they are eligible for parole. The two men had travelled to Wellingborough in possession of a shotgun and discharged the weapon at a 16-year-old boy who was riding a bike in Gold Street, on the evening of March 21, 2016. It is believed the victim was targeted in revenge for an incident which happened in October 2015 in which Phiri was injured. The teenager was not injured in the shooting. Detective Sergeant Keith Morson said: “This sentencing satisfactorily brings to a conclusion a very complex investigation. 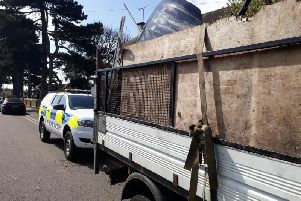 “Our enquiries took us to Milton Keynes, London, Luton and Bedford and the tenacity of the investigation team over a lengthy period led to the apprehension and conviction of the offenders. Detective Chief Inspector Lee McBride, added: “We are committed to tackling those people involved in gang-related activity, especially when serious acts of violence are used. “We will continue to provide a robust policing response to target those people we believe to be involved in serious and organised crime, especially when illegal firearms are involved. “This case shows that our work with partners, locally and in other parts of the UK does help to send offenders to prison and I hope our relentless pursuit of Phiri and Mbuku-Sengua acts as a deterrent to others who involve themselves in the illegal use of firearms. “We will continue to vigorously challenge those people involved in this type of crime and are reliant on the public’s help in our quest to tackle offenders. If you have any information about people involved in drugs or violence offences, call us on 101, report information online or call Crimestoppers anonymously on 0800 555 111.